I could spend like the next couple mins saying sorry for not posting but I've been sick and busy and it happens so I'm going to post daily til the 6th (Sunday!) and we'll call it even ya?! Let's start out small with the bits and bobs! To the right; I got this stunning little necklace, that goes with everything, in H&M (Brussels). 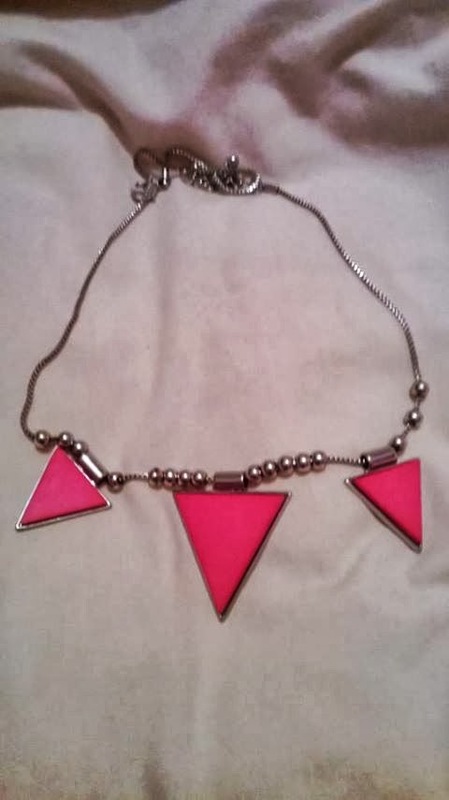 I think it was only about €14.99 - neon pink triangles with little silver beads. A small thing but it goes a long way. I like to wear this with a long black dress / blue pendulum top/ nice to add to a plain tank top or something, glam's things up a tad. Me and this bag have seen a lot of good times together! This is the bag I bring with me when I don't want a lot to carry, the bag I take on holidays, and nights out :) I bought this little cross over number for, I recall, €10 at Public Romance on Lower Abbeygate Street, Galway. A lovely vintage and 80's vibed shop. 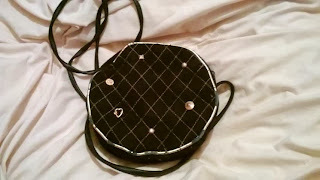 A bag velvet bag, threaded with gold, and topped with little charms. Now onto the clothes (sorry they look all wrinkly!). 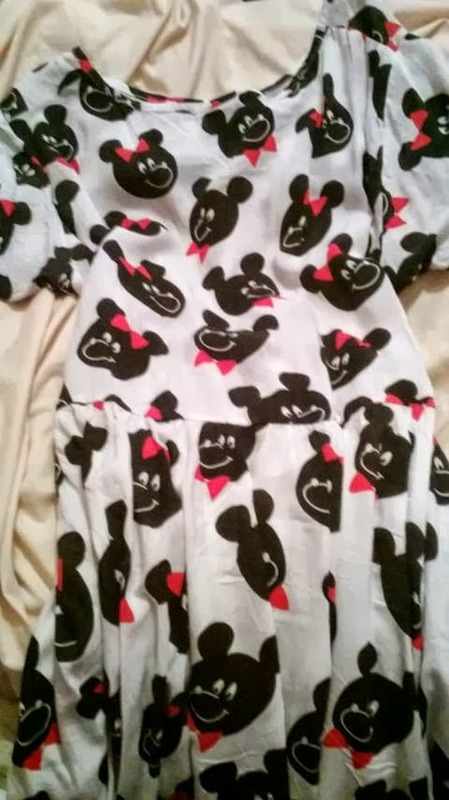 On the left we have this amazing dress from ModCloth.com for $54.99. 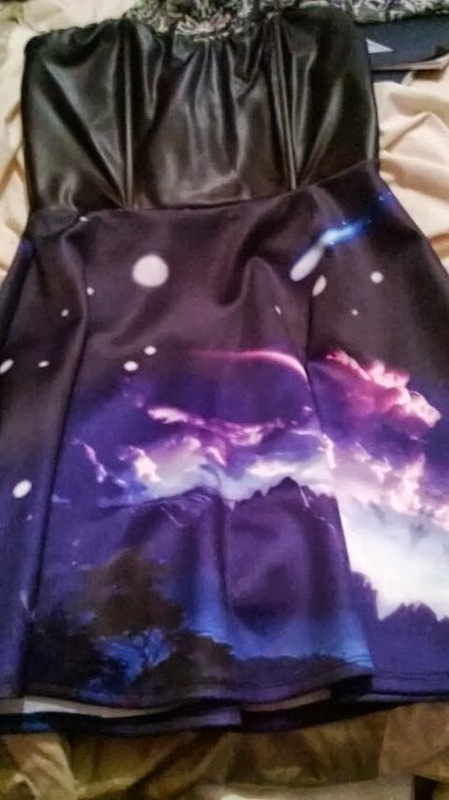 Leather at the top and galaxy at the bottom :) perfect combo! I have to say that I love the skirt part more so I tend to wear a jumper on top if it's cold out so I can show the bottom off. On the right, it's Penneys finest! I wore this jacket today and got so many compliments from people :) Army jacket with gold studs on breast and pockets, handy for any occasion!! Now this dress is something different altogether! I got this from one of my favourite shops and sites - LazyOaf.com. Some really quirky and amazing stuff. This is the Mr & Mrs Repeat dress, and I cannot stress this point enough - GET IT IN SMALL! It's supposed to be baggy and I have to put two belts on mine otherwise the wind will take me :) But it's really cool and I love it! 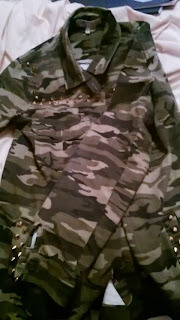 Reduced from £65 to £35, it is most definitely a must buy!!! !